Just been in Speke branch and seen a stack of the water seal by the entrance to outside building department,was not marked up as an offer or clearance,so don't know if availible in other branches.Water based so not to every bodys taste,not that you would want drink it? Used Thompson's water sealer for years in the building trade,But not this water based crap there old silicon based stuff was brilliant.This stuff will not go over old silicon based sealer,However Screwfix do a silicon sealer that is exactly the same as Thompson's old silicon sealer.And far better than water based. den 169 ,if you used a water based product on top of previous spirit based you will get that effect? I,ve just built a 8' by 7' shed and used Screwfix sealer and Iko sealer both spirit based on wood and boards both did a good job,still got a 5 litre Iko sealer got 2 from Wilkinson's that were wrongly priced at £11 each. Going to seal exterior house walls with the Thomsons seal picked 2 up to do the job. Iv'e been using Thompsons silicon based stuff for 40 years morrig,Bought the water based stuff by mistake i won't buy it again its crap.Try the screwfix stuff exactly as Thompsons used to be.I know water based sealer won't go over silicon based iv'e been in the building trade for 48 years. **** powers much of the internet in terms of hearsay, gossip & rumour, the original chemical constituents have changed in one form or another HOWEVER based on the same argument being put forward time after time on the internet it does not take a genius to check it out. OK so it might not be as good as it once was "might" but your statement was inherently flawed. "Thompson's One Coat Water Seal Ultra protects against water damage in one coat. The silicone micro emulsion effectively penetrates below the surface of porous materials carrying waterproofing resins deep into the pores of the substrate". Q. 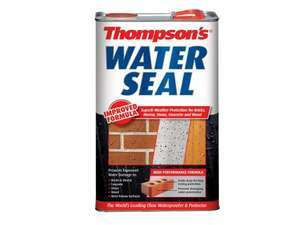 What is the difference between Thompson's Water Seal and One Coat Water Seal Ultra? A. Thompson's Water Seal is a solvent bourne, stearate based water proofer which can be used on a wide surface of materials such as brick, pointing, concrete, stonework, wood and other porous surfaces. Thompson's One Coat Water Seal Ultra is a water bourne, silicone micro-emulsion based water proofer suitable only for use on brickwork, pointing, concrete, stonework and other cementatious surfaces..
(so basically it might apply to one product in the range, but not the other, ..yet still there may also be better / worse products out there on a like for like price, in this instance I am referring to ULTRA). Thanks, please pass that info around to enlighten others who may be prone to misconceptions re the silicone aspect touted around. Adendum: you can overpaint one version over the other once the other stuff has worn out, it's not like you can never use it again, that is just plain wrong (by the very nature of the ingredients it is designed to repel, that means repel itself upon the point of saturation by application.